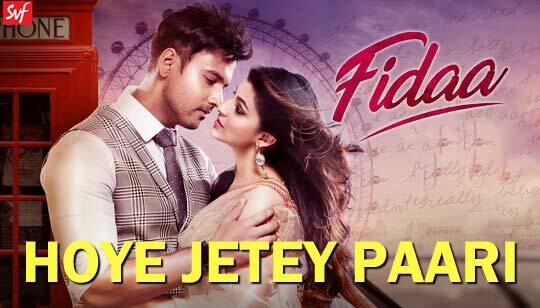 Hoye Jetey Paari Lyrics from Fidaa Bengali Movie Starring: Yash Dasgupta And Sanjana Banerjee Music composed by Arindom Chatterjee directed by Pathikrit Basu under the banner of Shree Venkatesh Films Produced by Shrikant Mohta. কখনো, দেখেছো কি ভেবে তুমি ? শুনেছো কি কান পেতে ? Kokhono, dekhecho ki vebe tumi ? Sunecho ki kaan pete ? News about Hoye Jete Pari Song Lyrics from Fidaa Bangla Movie Great news for all "Yash Dasgupta" lovers, The lover boy Yash Dasgupta And Introduce Sanjana Banerjee is the starring Main Lead Role In This Movie.